Backpackers.com — Welcome to your monthly update of new and noteworthy gear. I’m a dedicated gear nut and have tried on more hats, skis, backpacks, and pairs of high-end boots than you’d think possible. In this column I highlight new products that have tickled my fancy — either lesser known gear that deserves a wider audience due to sheer awesomeness, or new outstanding products from established industry giants. Our last column focused on high-end alpine gear meant to get you through the depths of winter. We wanted to give products that were not as cash-rich a chance to shine as well. This gear was selected because of its cost, innovation, or continued use in sub-freezing conditions. Looking for some well-built, lightweight, and affordable trekking poles? Look no further. For those of us who like using trekking poles but just can’t seem to plunk down a wad of cash for them, these inexpensive trekking poles from Cascade Mountain Tech really get the job done. The Carbon Trekking Poles are extremely lightweight, have an easy quick-lock mechanism for adjusting the height, and come with snow and mud baskets. I’ve been using them for nearly two years and have really enjoyed them. The grip feels comfortable in hand over the course of a long day and it seems the carbide spike on the bottom is holding up quite well. If you’re in the market for your first set of trekking poles you really can’t go wrong. If you’ve been interested in winter camping you have no doubt noticed that sleeping bags, especially 0 degree and warmer, are extremely expensive. There’s a good reason for this — the materials are all expensive, too — but there is such a thing as an entry level bag for alpine climate. Enter the Alps Mountaineering Zenith 0. It utilizes over 2 pounds of responsibly sourced 600-fill down to create a very cozy bag that weighs just a hair over 3 pounds, all for $265. With all that down and a tapered mummy shape, this bag checks off all the boxes and would be a great buy for a first-time winter camper. If there is a better deal on a great down jacket I certainly have not found it. The Sierra Designs Whitney is packed with 800-fill down, has a high collar and cord lock on the hem to keep drafts out, elastic sleeve collars, and a DWR treated rip-stop nylon shell. Oh, and it stuffs into its own pocket too! Essentially a standard premium down jacket, but for nearly half the typical price. You also get a zippered chest pocket, a kangaroo pocket on the inside, and two zippered handwarmer pockets. With 5.6 oz (160 grams) of 800-fill down in a 18 oz. jacket, this is sure to be extremely warm. I don’t know how Sierra Designs pulled off this price point but I’m glad they did. Here is one piece of equipment you should never adventure without. While through the lens of Instagram, the outdoors might only look like yoga pants and beautiful lakes, but there are real dangers out there and it’s important to be able to handle nearly anything an emergency. A solid medical kit is the first step (after which comes a satellite messenger and avalanche beacon, but that’s more pricey). Adventure Medical Kits is basically the standard of modern-day, easily purchased emergency packs. They fit anywhere, contain all your essentials, and come in different sizes. We recommend the Mountain Series for alpine adventure, and then pick a size based on your group. Pick one of these up, toss it in your pack, and hope you never have to use it. For a truly alpine edition, meet the Hilleberg Windsack. I can bet that few of you have heard of this product, or even knew there was such a thing. The Windsack is an excellent choice for your safety-minded outdoor adventurer, whether that’s you, a friend, or a lover. Weighing in at 16 ounces, it’s a lightweight bivvy sack hybrid that can save your life. In a raging storm the Windsack provides quick and easy shelter by providing a basic tent-like shell without the top. This allows you to: have a snack, change layers, tend to medical issues, or just take shelter from the storm. The bottom side is made with Hilleberg’s impressive Kerlon material and the top is windproof and snowproof. When traveling in the backcountry during the winter, or really any time of year, you should be prepared to shelter for an evening, even if you’re out for the day. This lightweight product can provide solid shelter for you and a partner, or two more if you get the three-person version. This has replaced carrying a bivy sack in both my kit and my wife’s kit. And you can turn it into a tarp too! Outdoor Research got their start building gloves and accessories for the outdoor market. The Arete glove is one of the brand’s best sellers, with features like a GoreTex waterproof insert, MoonLite Pile fleece (the same fleece used in their Everest-ready Alti Mitts), and a silicone palm for tremendous grip and dexterity. Gloves that utilize a liner and an insulted shell are great because of their versatility — it’s basically like getting two gloves in one! These gloves come in at a hair under $100 dollars and what’s even better is they come backed with the brand’s famed Infinite Guarantee. The “active insulation” market has suddenly exploded and among the best of this type of jacket is the Marmot Variant. Active insulation jackets are useful when the mercury drops but the inclines don’t. Major exertion in cold weather requires tremendous breathability so you don’t wind up soaked and hypothermic. We have covered a few of these jackets in our reviews, like the Outdoor Research Ascendant and the Patagonia Nano Air, and while those are excellent, they cost a solid chunk of change. The Marmot Variant is built with Thermal R insulation, a synthetic insulation that is very toasty. I have a pair of First Light pants built with it and I love it. This covers your core, and the back of the Variant made of highly breathable Polartech PowerStretch. This should keep you warm and fully mobile in all the right places while venting the heat you’re generating. Oh, Osprey, don’t you get tired of making the best backpacks? I guess they don’t. Introducing the 38L Mutant. From Ice Climbing, Ski Touring, Free Riding, or just a simple wintry day out on the trails, the Mutant is a fantastic winter pack. It boasts all the features you’d expect for a pack in the alpine category: A-Frame ski carry, helmet holder, ice axe loops, waist belt gear loops, and a three point haul system. The back panel features Snow Shed technology and should be great for those times you simply need to throw your pack on the ground to grab some snacks. This pack weighs only 2.7 pounds and fits all your winter essentials. What’s better? It comes with the all mighty Osprey Guarantee. 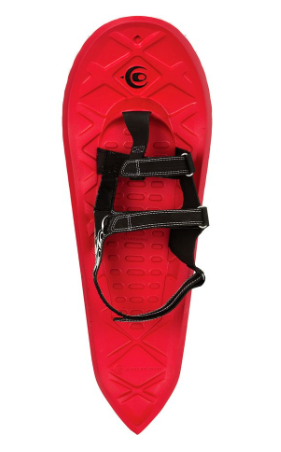 Crescent Moon has introduced some revolutionary snowshoes. This snowshoe is built with EVA foam so it feels extremely light underfoot while employing an otherwise classic design. The foam rocker bends gracefully underfoot and combined with the simple and easy to use binding, gives you a feeling of lightness that you just don’t get with traditional snowshoes. The underside of this snowshoe sports big lugs and cleats to help maintain traction on icy sections. A hidden benefit of these snowshoes is that due to its foam construction they actually help in insulate your feet! They’re not the cheapest snowshoes on the market, but they’re not the most expensive. And the innovation is pretty incredible. You are probably familiar with the traditional Smartwool Mountaineering Sock. The big fluffy grey sock with the red heel? Well, the PRO is the NEW breed of mountaineering sock — and it has been upgraded to be even better than before. The PhD Mountaineering Sock sports graduated compression and weaves in extra nylon, which they call “indestructawool”. I’ve had these socks for almost three years and they still fit and feel like they’re brand new. I love the compression for longer days on the mountain and when things are super cold I’ll wear these as a liner. I find these to breathe very well and I never get clammy feet with them. The compression makes them feel unlike any other sock you have worn and should help with fatigue for long and hard days on the trail. Note that while these socks are listed for Men, they work well for all genders. Just know your size.